This section contains various information, data & pointers related to existing glyph grid-fitting technologies. As described previously, the TrueType format associates to each glyph outline a bytecoded program written for a specific virtual processor specialized in geometric processing in the pixel space. Hence, the hints of a given glyph are really a program that is interpreted at run-time by a TrueType renderer. The program directly performs all grid-fitting operations on the scaled outline. This incredible flexibility is what allows such high-quality fonts as those distributed by Microsoft. However this has its price. The intermediate bytecode used is pretty hard to write for, and only a very few number of people in the world are able to "speak" it fluently. Most TrueType fonts are created with tools that try to automatically generate such programs from the hints they themselves provide, or those given by the font designer. Not all of these tools really produce good results, which is why, when TrueType first appeared, most of the fonts in this format had _very_ low quality on the screen. With time, the tools improved dramatically and it is now possible to create good-looking fonts relatively easily. Theorically, TrueType far exceeds the capabilities of Type 1 when it comes to rendering at low sizes, however it's high degree of technicality makes the design of good fonts a very lengthy process, actually longer than creating the equivalent good-looking Type 1 font. The quality of final glyph images is completely determined by the glyph program, which means that several TrueType renderers should theorically produce the exact same results. However, rounding considerations and scan-conversion approximation (during drop-out control, for example) often produce really minor differences between engines. TrueType is certainly the only technology that allows to hint glyphs in order to make them match perfectly hand-edited bitmap glyphs, though this can only done through a very long process, with very specialized tools. It is by far the technology that produces the best looking monochrome bitmaps. Regarding anti-aliased glyphs, Windows and FreeType 1.x use similar algorithms that approximate each pixel coverage with only 5 levels of grays. At small pixel size, this is however noticeable when reading large portion of text. Most other engines, including FreeType 2, uses a higher level number of grays for finer details. The hints in a Postscript Type 1 fonts are relatively simple compared to those of TrueType. They are however only suggestions given to the final renderer, and they more or less describe some aspects of the glyph or font. This means that a Type 1 renderer must be smart enough to interpret them correctly to produce good results. Note also that, even though Type 1 hints are relatively easy to generate, a lot of Type 1 fonts available are poorly hinted. Type 2 is an alternate glyph encoding format developed by Adobe for its CFF font format. It is more compact than Type 1 but contains basically the same hint information than Type 1. The quality of the rendered glyphs is highly dependent on the final renderer's ability to interpret the hints or even align the outline without them.. Most Type 1 renderers do a poor-to-good job with hinting monochrome glyphs. However, it is often possible to generate good-looking anti-aliased glyphs with very few hints and "intelligence". MetaFont is the digital type technology developped for TeX by Donald Knuth. It is based on strokes, rather than outlines, and describes each glyph in math terms. It is thus capable of parametric synthesis however. Indeed, the MetaFont book chapter 24 is named "Discreteness and Discretion" and deals with several ways to handle the pixel grid. However, the methods described there are a lot more cumbersome than what TrueType offers, and isn't capable of doing as much work. 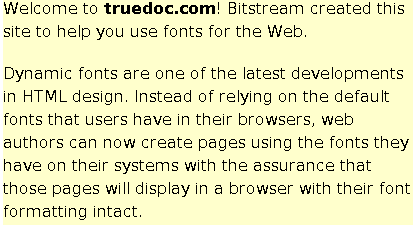 TrueDoc is a proprietary font format developped by BitStream. Its specification is now publicly available as part of the Digital Audio-Video Council specification. It can be found in Annex A of this PDF Document. Note that the format is covered by the following patent. TrueDoc is a derivative of the Speedo Bitstream font format (used for example in the X11 font server). The TrueDoc hints are very similar to the ones found in a Type 1 font. However, the "innovation" here comes in the way they are stored and also used to encode the outlines in the font. Basically, rendering a hinted TrueDoc outline needs to: first decode the hints and adjust them to the pixel grid, then load each outline element and _directly_ scale and grid-fit it using the adjusted hints. The TrueDoc file format itself, although highly messy, is compact and well suited to fast glyph decoding/rendering. The rendering quality of glyph images is however very dependent on the final renderer and the hints provided in the fonts. Curious users can have a look at the TrueDoc Site for more information. D-Type is a scalable graphics library that includes its own font engine. There is little information on it, except at their web site. Their engine is capable or real-time automatic hinting, though they advertise their own D-Type font format, which includes hints !?. Apparently, D-Type doesn't generate monochrome glyphs, only anti-aliased ones. The results seem very impressive however. See this this image for an example. T2K is a font engine developed by Sampo Kaasila, the original lead TrueType designer at Apple. His company, named Type Solutions Inc., was bought by BitStream in December 1998, and the engine has been revamped and renamed Font Fusion. More information is available on the Type Solutions web site. Notwithstanding the incredibly biased and hyped information given at its site, T2K/Font Fusion seems to produce very good results by automatically hinting fonts in real-time. T2K seems to have been licensed to Sun for Java. This could mean that its source code, or part of it, could be available under the SCSL, though I didn't take the time to download that _whole_ package. Anyone interested in finding out if its there ?? Apparently, T2K is able to generate auto-hinted monochrome images, though they provide absolutely no screenshots of these. Their anti-aliased images however seem at least as good as D-Type's. The Peripheral Systems Laboratory department of the Ecole Polytechnique de Lausanne has a patent on a method they call Perceptually-Tuned Grayscale Characters which is nothing more than a auto-hinting scheme used to improve the legibility/quality of glyphs. Note that this technique is describe by this patent and this publication. To be written. This is an open-source TrueType to Type 1 converter that apparently good hints when creating font files (unlike our own TTF2PFB which completely ignores them..).